Entertainment Tonight (ET)producers contacted Joey Skaggs and asked him to appear on the show. They were planning the inside scoop on great hoaxes and hoaxers: how the news media falls for their stories, what to watch out for and how not to be fooled. 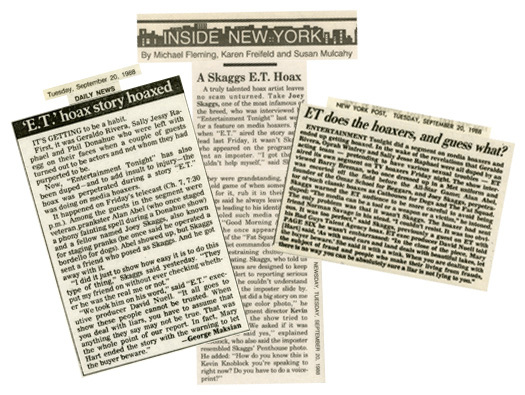 ET had previously done a profile on Joey Skaggs and his Bad Guys Talent Management Agency, so they could have checked their own video library to assure that the person saying he was Joey Skaggs was indeed Joey Skaggs. This is such a vanity oriented industry that they assumed no one in their right minds could resist appearing on their show. Joey had no problem resisting. What he couldn’t resist was the opportunity to hoax them. Instead of appearing himself, he sent his friend Norman Savage. The piece aired and the New York media jumped all over it. Entertainment Tonight never admitted they’d been hoaxed nor retracted their story.